Introducing Hamilton's Celestial Collection. Inspired by the stars, a brilliant grouping of diamonds drawn together to create a single, sparkling jewelry collection. A glimmering constellation of diamonds are joined for a distinctive and timeless collection. 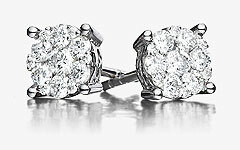 Available in 18k white gold diamond cluster designs in pendants and earrings.